Our dedicated New Business Team of over 25 banking professionals are based across the country to ensure you can connect with us easily. We have offices in Dublin, Cork and Galway. We will get to know your business and your strategy to understand what’s important to you. We work with businesses, Investors and Advisors across a variety of sectors and transaction structures and have a track record of success in our markets. You can see recent examples of transactions here below. * Based on BOI analysis of independent industry statistics 2017. The team is led by senior banking professionals ( view our experience ) with extensive networks and market insight built on over 50 years’ combined experience operating in financial markets. The global economy is constantly on the move. We can help you navigate it. Every business trading internationally faces unique risks. We offer a complete range of solutions to help you make international transactions efficiently and manage foreign currency and interest rate risk. Bank of Ireland Corporate Banking’s Cork office is located at 32 South Mall, Co. Cork. 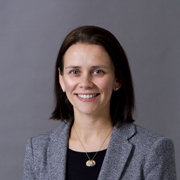 Nikki has over 25 years’ international commercial banking experience. 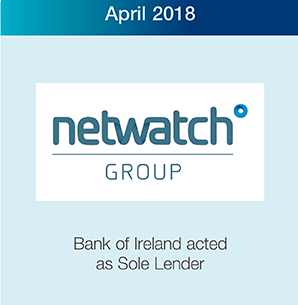 Prior to re-joining the Corporate Bank as Head of Origination, Nikki worked in a variety of senior business and strategic roles across the Bank of Ireland Group including Head of the Retail Business in Global Markets and Head of Sectors in the Business Bank. 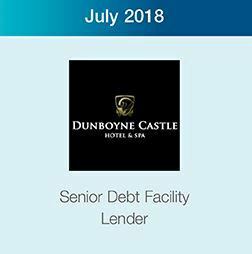 Prior to Bank of Ireland, Nikki worked for 8 years for Barclays Capital in London in their structured finance and debt capital markets division. 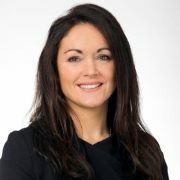 Nikki is a Certified Banking Director and holds a BComm in Banking and Finance from UCD. 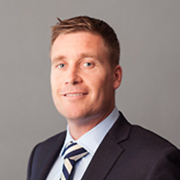 Ken has worked for a number of domestic and international financial institutions in Structured Finance, Restructuring, Origination and Syndications over his 15 year career. 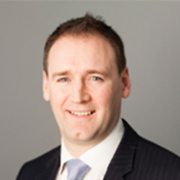 Ken leads our origination team for new to bank customers operating in the Republic of Ireland through our Dublin, Cork and Galway offices. 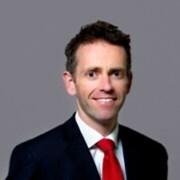 Ken is a BComm graduate of UCD, Masters graduate of DCU and recently completed a Diploma in Strategy and Innovation with the IMI. Bank of Ireland is the largest lender to the Irish economy, and our appetite to lend to Ireland’s best businesses has never been greater. We will engage with you quickly and look to give you quick decisions so you always know where you stand. Our track record in deal innovation and execution has resulted in multiple “deals of the year” awards in recent years. We’re in this for the long term, not just today’s transaction. You’re just a call or a meeting away from a wealth of knowledge, experience and connections that will benefit your business. Just ask the question and let us show you what we can do. We’re connected and deeply integrated into the business community, so you will benefit from our broad sectoral knowledge and extensive network. Our international presence in the US, UK and in the EU, as well as our Global Markets expertise provides you with quick, timely access to international and market insights to help your business perform on the world stage. Our team of highly experienced professionals combines a depth of credit experience, with a commercial, responsive and flexible culture. We benefit from a streamlined decision-making process and are fully committed to providing timely, decisive and consistent service. 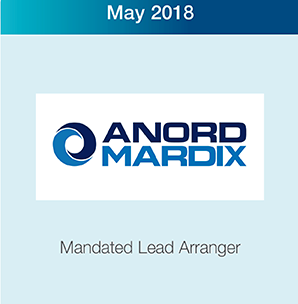 Since 2010, in excess of 157 Mandated Lead Arrangement transactions have been completed. 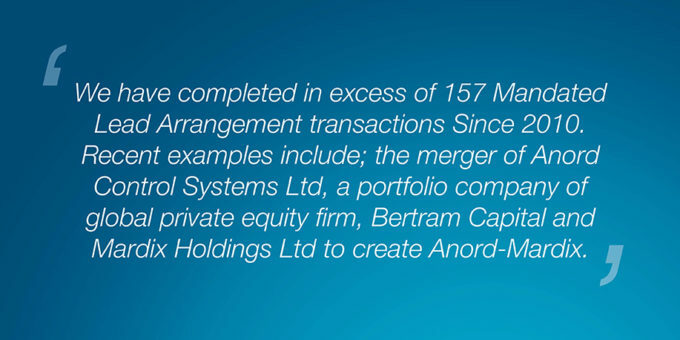 Recent examples include; the merger of Anord Control Systems Ltd, a portfolio company of global private equity firm, Bertram Capital and Mardix Holdings Ltd to create Anord-Mardix and the establishment of Netwatch Group following the merger of four market-leading monitoring companies, with the partnership of Riverside. Our debt solutions for private equity investors and corporate borrowers, include; senior, uni-tranche and super senior facilities. 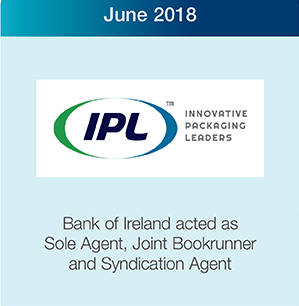 Working closely with our colleagues in Bank of Ireland Global Markets and Bank of Ireland Finance , the team can access a range of complementary products such as interest rate and exchange rate hedging instruments, cash management solutions, invoice discounting and other asset finance solutions to provide a tailored financing package. 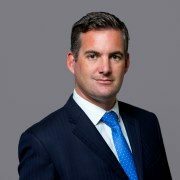 Our approach combines exceptional domestic market reach, leveraged finance structuring expertise and a full service corporate banking relationship offering. 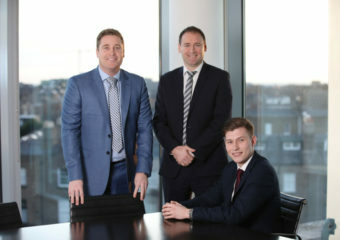 The strength of our domestic brand, coupled with Global Leveraged Finance colleagues in London, Paris, Frankfurt and the US provides us with a unique capacity to seamlessly execute transactions across multiple jurisdictions, making us the ideal banking partner for international private equity firms or debt advisors doing business in Ireland. Domestic and international acquisitions and capital expansion.